This is an article written by Greg Grant and Jerry Parsons in 1989 after an extensive lantana trial for several years on the Verstuyft farms; the article appeared in San Antonio Light and Express-News newspapers. Parsons had written a similar article in June, 1987, about 'New Gold' lantana and did the first television on the variety on June 26, 1987 (televised on CBS news affiliate KENS-TV in San Antonio). Estonian translation of this page provided by Valerie Bastiaan. 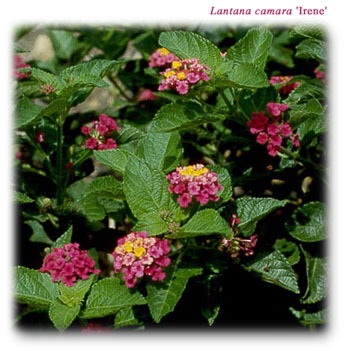 Lantana, of the vervain family Verbenaceae, consists of more than 150 species of shrubs and herbaceous perennials. Lantanas are mostly natives of the Tropics and subtropics of the Americas but some are natives of warm parts of the Old World. Their name is an ancient one used for the quite unrelated genus Viburnum. Wild lantanas are hairy and often prickly-stemmed. If rubbed and bruised, their leaves usually have a pungent odor. Verbena-like flowers are formed in clusters from the leaf axils or at the ends of branches. The small, berry-like fruits contain seeds. In some regions, Texas included, lantanas grow wild as weeds, chiefly spread by birds that are very fond of their juicy fruits. The species name for the native L. horrida, refers to the pungent odor of the crushed leaves. European interest in the New World lantanas was first excited by their reputed medicinal virtues. Spanish colonists used the "camaras," as they called them, to make infusions to be taken as medicine and used in baths. In some places such infusions are still used medicinally. The plant is poisonous to cattle and sheep, though usually not browsed by them. A decoction of the leaves has been used in Mexico...as a tonic for the stomach. In Sinaloa, the plant is a favorite remedy for snake bites. A strong decoction of the leaves is taken internally and a poultice of crushed leaves is applied to the wound. In recent years, strains of dwarf varieties have become popular as bedding plants. The lantanas are very free-flowering from spring until frost. All types can be used in containers and the trailing types make excellent hanging basket specimens. 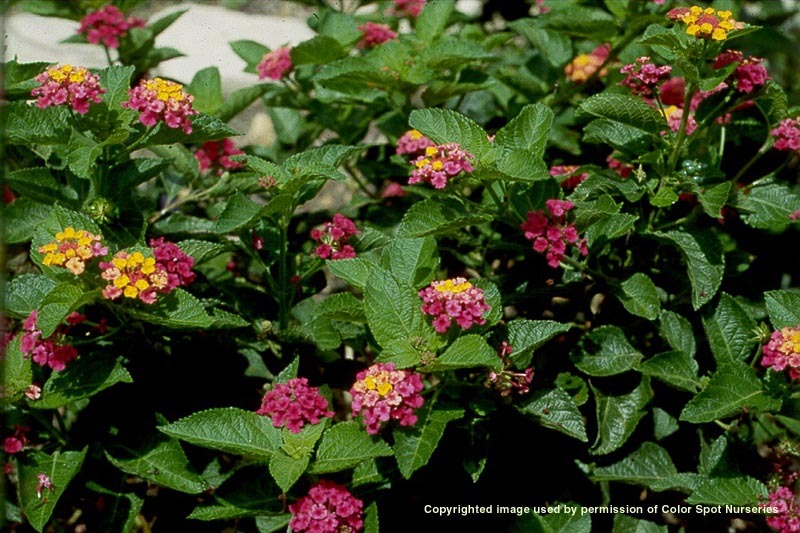 Lantana has been improved in its usefulness as a bedding-plant largely through the efforts of French hybridists. The older varieties are tall and lanky and set a heavy crop of berry clusters but are showy in hot weather. The new varieties are dwarf, spreading and bushy in habit, early blooming and free- flowering, and are available in a much wider color range. Varieties are available in many colors from white through yellow, orange, to deep red, hot pink and purple. Often the older outer flowers of each cluster are of a different hue than the younger, inner ones. The ABSOLUTELY BEST improvement which has been made is sterilization. Several new varieties bloom profusely but NEVER forms berries which normally have to be removed before more blooms will be produced. This revolutionary new development in lantanas insures that the plant will be a continuous blooming beauty. Sterile varieties which are available include New Gold, Dwarf Pinkie, Samantha (Lemon Swirl), Weeping Lavender and Weeping White. The lantana is a great landscape plant which is very adapted to this area provided they are grown in a sunny location. When established, the plants are very drought tolerant, and continue to produce bright and attractive blooms in the hottest of weather. Although a tender perennial, lantana is best used as a warm season annual, replanted each spring. New Gold -- bright yellow, sterile flowers, spreading habit. This new variety named New Gold blooms profusely but NEVER forms berries which have to be removed before more blooms will be produced. This revolutionary new development in lantanas insures that this plant will be a continuous beauty rather than a virulent pest with its unwelcomed seedling offspring. But you MUST insist on the New Gold variety; all other lantana varieties exhibit the characteristics which lead botanists to label them with the highly unfavorable specie name of horrida. Texas Flame (Dallas Red, New Red) -- Orange/yellow/red tricolor blooms which turn to deep red, a compact bush. The reddest lantana available. Samantha (Lemon Swirl) -- Bright yellow, sterile blooms and beautiful variegated foliage on a compact bush. A beautiful plant even without blooms! For further information about Aggie Horticulture, see our about page. Texas AgriLife Extension Service, Texas A&M System.